Google account manager apk is a complete and easy to understand guide to use “Google account manager” to remove FRP lock from any android device in 2018. Well, if you know the tricks for factory resetting the phone, then you are also aware of Factory Reset Protection lock or Google verification lock (aka FRP lock). The FRP lock plays an important role in protecting your phones data. It prevents people from getting access to your phone through a factory reset. However, it can in return create problems for you too, as it also prevents you from getting access to the phone when you need it immediately. So, you need something to help you access your phone in the time of utmost need. In this case, if Google account lock blocks your phone or the factory reset setup wizard asks you to enter the details of your Google account. Then using the Google account manager you can remove the previous submitted google ID and its password, also let you submit the new Google account details to access the phone again. This is the easiest way that you can use to deactivate FRP lock from your device and one of the most important step in the FRP bypass step-by-step guide. With the help of Google account manager apk, performing FRP bypass becomes an easy task to achieve. Furthermore, you can also remove your previous Google credentials from the setup in case you do not remember them. So, do you want to know more about Google account manager APK? Do you want to know the tricks to perform a successful Google account bypass? Well, scroll down to learn more. But before we start our guide to deactivate FRP lock, you need to know more about Google Account Manager and its features in detail. Like we mentioned before, the latest version of the application is Google account manager 8.0, 8.1 Oreo. So, we are focusing on its system requirements and details. But we can assure you completely in case you are looking for any other version of this App, then you can follow the guide to download it. The Google Account Manager APK 8.0, 8.1 is 8 MB in size and it works for Google Android marshmallow and in its higher version. Furthermore, your phone must have at least 512 MB RAM to run this application. Supported: Android Lollipop 5.0.1 to Android Nougat 8.0. Of course, the APK can be downloaded for free. One is not charged anything to download the APK. All you need to do is to download it and follow some certain steps to use it to bypass the FRP. You probably know about it by now. The latest version of the Google Account Manager APK is supported on Android marshmallow and all the other higher versions of Android. So, if your phone is new and it runs on the latest Android version, then you do not need to worry since the APK will work perfectly on it. The Google account manager apk is completely safe and trustworthy. You do not need to root your device or go through any extra hassle to use it. Plus, it is completely safe as it does not threaten the security of your data or makes your vulnerable to malware at any cost. Thus, you can use it without any worry. If you are looking for a trustworthy app to unlock the Factory Reset Protection Lock, then this is the best app that you can choose to unlock your device. The Google Account Manager APK makes it easy to unlock your device. All you need to do is to follow few simple steps to successfully FRP bypass your device. Of course, this trustworthy app is completely easy to use. It has a very user-friendly interface. So you will not have any problem in figuring out the trick to use it efficiently. The options are really easy to find out and you will never have any problem to navigate through the app. The Google Account Manager APK is mostly compatible with all the major devices from popular brands. So, you will never have any trouble in using it to unlock your device using the APK. The APK is compatible with all the Samsung Galaxy devices. Apart from that, you can use the APK with Sony Xperia, Motorola, Alcatel, Huawei, Google Pixel, Google Nexus, HTC and LG devices without any hassle. 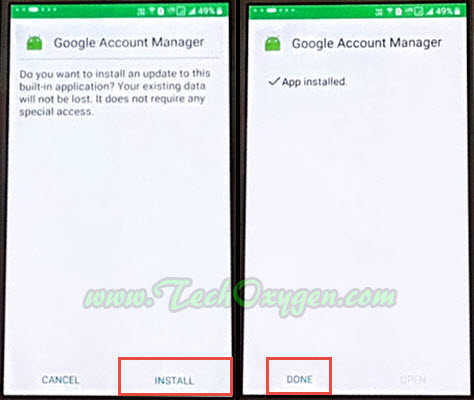 How to download Google Account Manager APK in 2018? The very first thing that you need to do is to download the APK file. You can download the supported version for your device, the links are given above. In most cases, your device blocks the installation from any unknown source. So, you need to go to the settings of your device and permit the installation of the apps even from unknown sources. In this step, you need to open the file that you have already downloaded and install the APK to your device. Once you install the APK, you can perform FRP bypass by simply following the simple steps that the app offers. Well, that’s all for the guide. As you can see, the Google Account manager is very easy to download and is also very easy to use. By putting minimum efforts, you can have it on your mobile. Thus, download the app by using the steps above and unlock your FRP lock without any problem.